The Sumpter Valley Dredge is nestled at the base of the majestic granite peaks of the Elkhorn Mountain Range. The Powder River is born deep within the range and picks up speed as it spills down the Sumpter Valley, traveling through the park before reaching Phillips Reservoir. This waterway was the vein of life during the boom days of the gold rush. The landscape still bears the scars. Miles of tailings line the banks of the river, a remembrance from the prosperous days of mining. The Sumpter Valley Dredge -- the centerpiece of our park -- left much of the rocky footprint that you'll see on your trek along Highway 7. 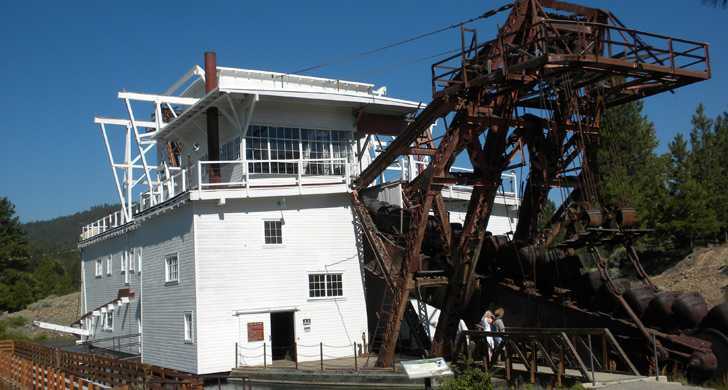 The dredge is an important link to Oregon's pioneering past and development. 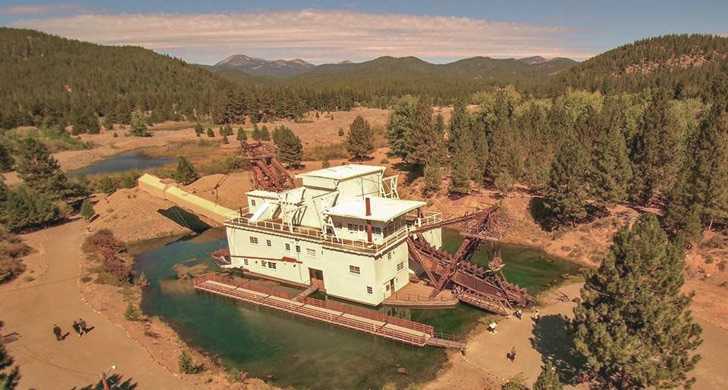 It is one of the largest and most accessible gold dredges in the U.S.
A half a century after the last dripping bucket load was lifted, the dredge stands silent. If you listen carefully, you can almost hear whispers of the hope, sweat and dreams of the people who worked on it. 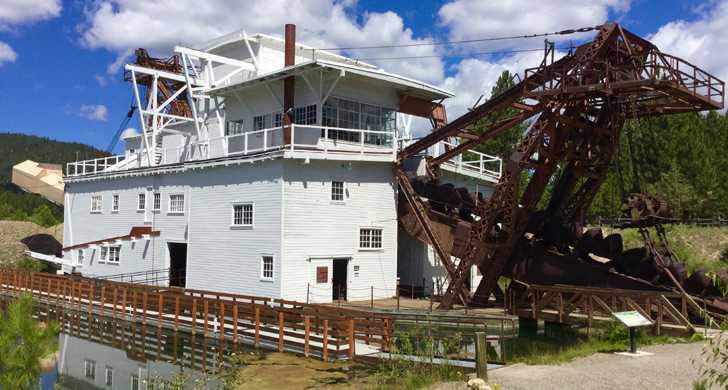 After visiting the dredge you may continue on the Elkhorn Scenic Byway to continue your trip into history. The dredge in the park is the last of three built on the Powder River. Built in 1935, it ran until 1954. It dug up more than four million dollars worth by a simple, but dramatic method. Sticking out from the dredge's hull is a massive boom bearing 72 1-ton buckets. The buckets, moving like the chain of a chainsaw, would bore into the riverbank and carry the loose rock back into the dredge interior. Once inside, the rock would pass through a series of steel cylinders to separate the material by size, sending the smaller material deeper into the dredge. Using water and sluices, the gold would be separated from the sediment. The spoils from this process and larger rock pass through the back of the dredge and are deposited behind it via another boom.